The Samsung Ativ Odyssey is an LTE enabled Windows phone with NFC. 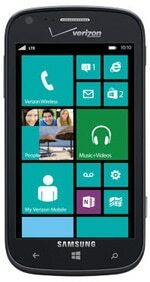 The device features a dual core 1.5GHz processor, a 4-inch 480 by 800 pixel display, and runs Microsoft’s Windows Phone 8 operating system. The handset, originally known simply as the Samsung Odyssey, came to light in court filings, made during Samsung’s ongoing legal fight with Apple, along with another model called the Marco which is not advertised as having NFC. The Ativ Odyssey i930 is available from Verizon in the US.